Maria Coakley David at the inaugural DC’s Dancing Stars Gala. Photo provided by DC’s Dancing Stars Gala. A Valentineâ€™s gift turned franchise, turned charity event that raised $165,000 in itâ€™s inaugural year-thatâ€™s the story behind DCâ€™s Dancing Stars Gala, which is back for a second year this Saturday. Eleven local personalities, including ABC 7â€™s anchor and reporter, Jummy Olabanji, WUSA 9â€™s anchor and reporter Larry Miller, and Andrew Baldwin, distinguished U.S. Navy Physician and ABCâ€™s The Bachelor, will face-off at the Hyatt Regency, Tysonâ€™s Corner, Saturday October 24th. Emmy winning actor Vincent du Paul cohosts as dancers competeÂ for the chance to take home the 2015 DC Mirror Ball Championship trophy and $10,000 for the charity of their choice. Maria Coakley David, who opened the Fred Astaire Dance Studio in Fairfax with her husband, and launched the DCâ€™s Dancing Stars Gala with the help of an amazing team of committee members, charity partners, and volunteers, recently took some time to speak with us about all things related to dance and giving back. My husband Jim didnâ€™t really have any real background or exposure to dancing, and he really didnâ€™t like it at first, but he saw how it was renewing a great thing in my life. Pamelaâ€™s Punch: Please share a brief/educational career background, and what led to the founding of DCâ€™s Dancing Stars Gala. Maria Coakley David: Iâ€™m a graduate of the University of North Carolina, Chapel Hill. I graduated with a business degree with a focus in accounting, and I am a certified public accountant. I started with one of the large firms, and then joined the family business C. J. Coakley Co., Inc. that was founded by my parents, and now Iâ€™m the CEO and CFO of that commercial construction company that has been in our family for over 50 years. Along the way, one Valentineâ€™s Day, my husband, Jim David, gifted me some dance lessons. I had danced as a child, and my husband and I then started dancing, and about three years after that, a little after Valentineâ€™s Day, we opened our dance studio. Jim was not a dancer at all, but it was just one of his fun ideas where he ended up dreading ever opening up this can of worms (laughs). HeÂ didnâ€™t really have any real background or exposure to dancing, and he really didnâ€™t like it at first, but he saw how it was renewing a great thing in my life.Â With four kids, we donâ€™t tend to do a lot for ourselves-we are always facilitating their fun with after school activities and their hobbies, and I really wasnâ€™t doing anything for myself. I thought dancing would be such a great stress release, and much more fun than the treadmill. He eventually got on board, and really liked the business model-we are both from entrepreneurial families-he thought this would be a fun thing for us to do together, and so he contacted the corporate office about franchising opportunities. He went through the whole process, and then, â€œGuess what? Iâ€™m giving you a dance studio!”Â (laughs) We kind of plunged into this, but it has been a lot of fun, and it is great to share the joy of something that you truly love, and you can see the impact in peopleâ€™s lives. I was talking to someone just last week who told me about how itâ€™s been such a great reprieve to come, just forget about the world, listen to music, dance, and learn something new, and just have fun. There are also so many cool things that go along with dancing: -competitions, showcases, parties and events. I used to call it prom for adults. Jim now says how much more fun it is to go to weddings, on a cruise, or anywhere that has dance. My husband is now really excited about dance, he is even competing, so itâ€™s been a complete 180 for him (laughs). I was dragging him along in the beginning. I think thatâ€™s pretty typical for men, they are the leader, and they have a little bit more of a learning curve than the women. Along the way with the dance studio, we had talked to some folks from some other cities who had been doing a Dancing with the Stars type event, but we knew we needed to grow before we could tackle something of that nature. A few years later we were asked by Marymount University to do a Dancing with the Stars for the University, which we have done for three years. Shortly after that I chaired another large gala, and we had grown the staff to a point where we could consider doing something more for the entire DC area. We then put together a team to do just that. Pamelaâ€™s Punch: What do you enjoy most about dance? MD: Itâ€™s hard because I love so many aspects of it, but I just think the music and the movement, getting that stimulation, and just being able to forget about everything else, and being able to do something beautiful and fun. Some of my favorite people that I dance with are in their 80s and I even have one lady that is in her 90s and she is a beautiful, beautiful dancer. Dancing is so good for you-itâ€™s a hobby to carry through your whole life. How do you choose the charities you support? MD: In order to get something of this magnitude off the ground, the strategy was to partner with some charities, so we were looking for charities that could really help us with volunteers, help us with spreading the word, getting out into their networks, social networks, donors. We were really looking for partners. In addition, we wanted to find charities that people were willing to get behind. We had a few people step up and say if you add my charity, Iâ€™ll be a major sponsor. It was those kinds of things that helped us select the charities in the first year. This year, we returned to partners that really had been partners. There were a few charities that really just took the check, but there were some that really got involved and impacted the results and impacted the bottom line, and so those were the people we really returned to this year. Along the way, we had a few committee members that proposed charities, I did some due diligence to make sure they were highly rated, and that they donated a very large majority of the percentage of the funds to the actual charity, that they werenâ€™t admin heavy, and had a good mission. Personally, The Leukemia and Lymphoma Society was an important charity for our family, and that was one of the reasons that we chose them for our Gala, and we were a major donor. Competitors from the inaugural DC’s Dancing Stars Gala. Photo provided by DC’s Dancing Stars Gala. PP: What are the long term goals for this event? PP: Do you watch Dancing with the Stars, and if you do, who has been your favorite contestant? MD: I absolutely watch the show, and I love it. My favorite professional is probably Derek Hough. My favorite contestant-I really loved watching Kristi Yamaguchi, and I also really enjoyed Rumor Willis more recently. I also really enjoyed watching Cloris Leachman. To be in her 80â€™s-sheâ€™s such a good role model, for everyone, that this is something you can do for a lifetime. Some of my favorite people that I dance with are in their 80s and I even know one lady that is in her 90s and she is a beautiful, beautiful dancer. Dancing is so good for you-itâ€™s a hobby to carry through your whole life. PP: What is your favorite style of dance? MD: That is impossible to answer, but I do really love Waltz, and I also really love Rumba and the rhythm dances. The music and the movement, getting that stimulation, and just being able to forget about everything else, and being able to do something beautiful and fun-that’s what I love about dance. 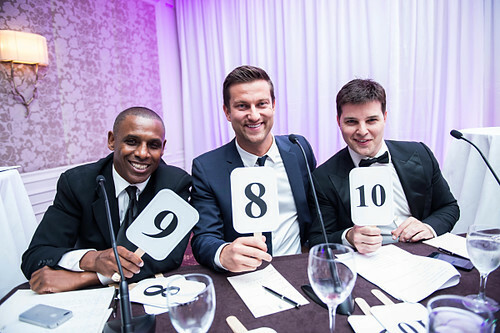 Judges at the inaugural DC’s Dancing Stars Gala. Photo provided by DC’s Dancing Stars Gala. PP: What is your favorite dancing memory? MD: My very first competition. It was the largest competition in the Fred Astaire chain in Las Vegas. I had never done this before, and we were one of the highest numbers, 270, so we were always called back last, and we would always be waiting, and then the announcer would say, “ANNNND, TWOOOOO, SEVENTTYYY!â€ It was just crazy how much fun that was, to be called and get to go back and dance on the floor again for the next round. Iâ€™ll never forget that number. I danced that competition with Javier Buentello, who is currently our Studio Director-he was the first instructor I ever performed with, so that was pretty cool.